It’s said that Canada has two seasons – winter and construction – and now that the roadwork is finishing up, it’s time to face the fierce Canadian winter. Though trading in fluorescent orange signs and pylons for icy roads and 4:00 p.m. sunsets may not seem like a step up, SmartCoverage is giving drivers a reason to get excited! We want to make sure you stay safe on the roads this winter. That’s why we're offering to cover the cost of your winter tires. 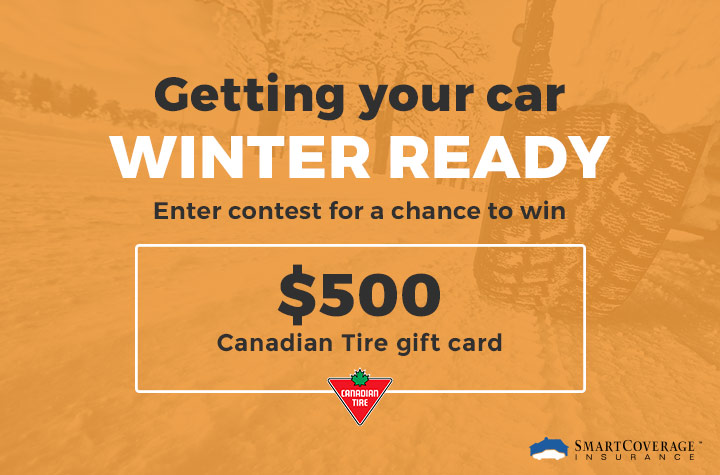 Obtain a no-obligation quote between Nov. 7 and Dec. 7, and you’ll be entered to win a $500 gift card from Canadian Tire. Start your quote here for a chance to win. Read the official contest rules to see whether you qualify. Why do I need winter tires? Winter tires are better suited to the hazardous conditions of Canadian roads than regular all-season tires. They are scientifically engineered to provide better traction, which increases your control on wet and icy surfaces. In some provinces around the country, putting winter tires on your car is the law. But even in provinces where winter tires are optional, they are an excellent way to help you traverse Canada’s treacherous winter roads safely. And while winter tires are an investment (unless you, say...win a contest), installing them can earn you a little money back. Some auto insurance providers offer a discount to clients who install winter tires on their vehicle because they make for safer driving conditions. For many people, the first significant snowfall of the year serves as a reminder to call the auto shop. But whether or not your place of residence has seen any of the white stuff yet, it’s a good idea to be proactive. Planning not only ensures you’ve got the right treads all winter, but it also means you won’t have to contend with the crowds clamouring to get their tires on in the wake of the first blizzard. You can get winter tires from many auto shops, and most will also install them. You can call around to see which shop offers the best price, but of course, there’s no better price than free. So let us cover the cost this year – sign up for an auto insurance quote and be entered for a chance to win. To be entered for your chance to win, simply obtain a no-obligation auto insurance quote using the button below. Not only will you be entered to win a $500 gift card for Canadian Tire, but you'll also see how much you can save on your auto insurance premiums each month. Best of luck, and safe driving this winter!